The makings of a trend setter. Made of 100% silk, give Him this exclusive two piece tie set by Milden. 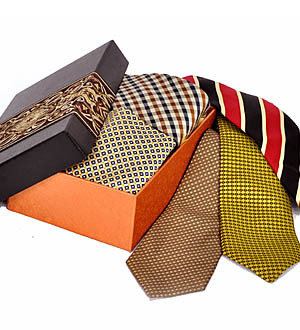 Ties come in complementing colours and design. Ties arrive in an elegant Nuscomit box. Note: Tie colour and design vary with season. Same day delivery applies for order made before 12pm on a working day. For outstation delivery within Malaysia, at least 3 working days notice required. Call Giftlab at 03-78830233 / +6012-6915200 or email us at sales@gift-lab.com for assistance.